ARLINGTON, VA – February 16, 2017 – A new national survey conducted jointly by leading Republican and Democratic researchers reveals that voters across the political spectrum overwhelmingly oppose eliminating federal funding for public television and that more than 7 in 10 see public television as a good or excellent value for their tax dollars, on par with investments in highways, roads and bridges. The telephone survey of 1001 registered voters was conducted in early January by a bipartisan polling team from American Viewpoint (R) and Hart Research Associates (D) on behalf of public television. In a joint memo released today, the pollsters write, “Our survey finds that while the country may be deeply divided on many issues, the importance of federal funding for public television is not one of them. In fact, with remarkable consistency, majorities of voters of all political stripes support federal funding for public television and do not want to see it eliminated. 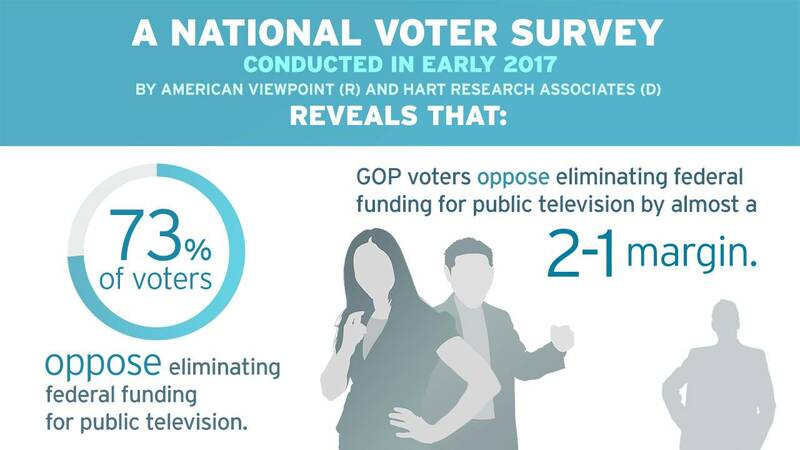 Voters see public television as a good value proposition for the American taxpayer, and express high levels of concern about the consequences should federal funding for public television be eliminated. - 73% of voters oppose eliminating federal funding for public television and GOP voters oppose it by almost a 2-1 margin (62%-32%). - Public television is rated as an excellent or good value for their tax dollars by 72% of voters, on par with highways, roads and bridges (73%). Among GOP voters, public television received higher taxpayer value ratings than unemployment benefits, federal aid to college students, agricultural subsidies, environmental protection, and foreign aid. - 3 in 4 voters want federal funding for public TV increased or maintained at current levels. 66% who voted for President Trump favor increasing or maintaining federal funding for public TV, as do 86% of those who voted for Hillary Clinton. - 83% of voters – including 70% of those who voted for President Trump and 93% of those that voted for Hillary Clinton – say they would tell their elected representatives to find other places in the budget to save money if asked their opinion about eliminating federal funding for public television. This holds true regionally in the Northeast (88%), South (80%), Midwest (82%) and West (84%). Notably, this number is even higher among voters in states that flipped from blue to red in the 2016 election, with 85% of voters wanting savings to come from somewhere other than public television. - More than 8 in 10 voters have a great deal or fair amount of concern that ending federal funding for public television could eliminate local stations’ public safety communications services like AMBER Alerts and severe weather warnings. Similarly, 76% of voters express concern about public television having to significantly cut educational shows that help children prepare for success in school. - PBS/public television enjoys a very high image rating among the electorate (69% positive v. 7% negative). Among those that voted for President Trump, PBS/public television has a much higher positive image rating (60%) than the traditional broadcast networks (37%), cable TV networks (41%) and newspapers (24%). - 2 in 3 voters think it is very or fairly important for America to have a strong public television system. - A top reason for protecting federal funding for public television is that it provides more than 120,000 trusted learning tools and free resources for teachers, parents, and caregivers to use in the classroom and at home. 67% of Republicans, 73% of independents, and 87% of Democrats found this to be a convincing reason. - Arguments for eliminating federal funding for public television do not resonate strongly with voters of any political affiliation. Common arguments for eliminating federal funding for public television, such as the number of channels available on cable and other pay television services, were found convincing by just 21%-26% of voters. Hart Research Associates (D) and American Viewpoint (R) conducted a nationwide telephone survey among a representative cross-section of 1001 registered voters. Interviewing was conducted January 4-8, 2017, and the survey has an overall margin of error of ±3.1%.